This Friday, May 31 - SON DEL CARIBE plays at Whisky Bar! The best music by DJ Rudy! Salsa Mondays @ Blue Wisp Jazz Club canceled! URGENT: Salsa Monday tonight at Blue Wisp Jazz Club has been cancelled! We apologize to all our supporters, but the Blue Wisp management didn't bother to tell us that they were not opening tonight! Due to these circumstances, we won't have any future events with Blue Wisp! We'll keep you posted about our future location for Salsa Mondays! The date is set for Saturday, May 18, and everybody is invited to participate and support. So please spread the word to all international groups and let us know if you or your group would like to participate. We plan to make the 2013 AWL International Festival the best ever!!!! Anybody else having a Birthday? Let's celebrate together! With the BEST DJ in Cincinnati: DJ Rudy Alvarez! The Best and Largest Salsa Dance Floor in Cincinnati! All are performing in memory of a dear friend, Virginia Malton. 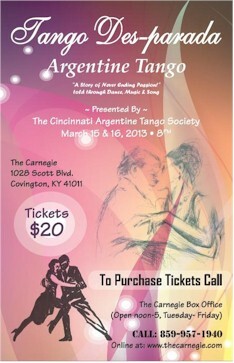 Proceeds will benefit organizations in Greater Cincinnati to help promote Argentine Tango Dancing and arts education. This show will leave you with a theatrical experience you will not soon forget . 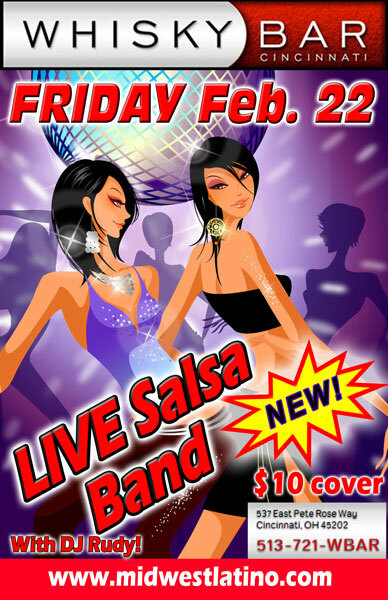 For the first time ever we'll have a Live Salsa Band @ Whisky Bar, in the Main Room. Our 2012 Salsa Halloween Party was fantastic! Thanks to everybody who came and had fun with us! And Happy Birthday to Patty! Stop by this Thursday to check out our new location, and experience for the first time EVER hot Latin rhythms being played at the Banks! A BIG "Thank you" to everybody who came and supported us! 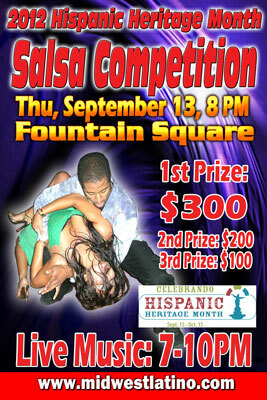 Come to the Fountain Square on Thursday, September 13th, to participate in the Kick-off of Hispanic Heritage Month. - a Salsa Competition with the 1st Prize of $300, 2nd Place: $200, and 3rd Place: $100, and attractive trophies for the top 6 couples. Don't miss the opening of the Hispanic Heritage Month! Our FIRST EVER Saturday Salsa Party @ LUNAR!!!! Come and join us as we celebrate the World Choir Games with choirs from Latin America, and from around the world! See pictures from Thursday Salsa Parties at LUNAR below. Saturday will be even better!!! YES! On Wednesday, July 4th, we're celebrating Independence Day Salsa-Style! The #1 Salsa event in Cincinnati for 7 years! The PENGUIN is the place to dance Salsa on Wednesday nights!! This is the Welcoming Party for Choirs from Latin America participating in the World Choir Games! Our new city video will debut on Fountain Square tonight at 5 pm. American Idol's Eben Franckewitz will be there to sing. Join us! The City that Sings branding effort includes billboards at the airport, a wall mural by the Purple People Bridge and signage on 500 flower pots throughout the City. The City Council voted 9-0 to support this initiative to brand us as The City that Sings. Famous celebrities with ties to Cincinnati star in this music video produced by Cincinnati Council Member Laure Quinlivan. Cincinnati is host of the World Choir Games, proud to be The City that Sings! HOW TO ENTER CITY VIDEO CONTEST TO WIN CASH PRIZES. Create your own video using same lyrics and melody, up to 5 min. View our "Cincinnati's Singing" video. Click "Respond to Video" box, select "Create Video Response". Upload your video or select from your Youtube page. To complete your entry, email us your contact info, video title, entry description and credits to citythatsings@gmail.com. Your entry will not appear until we get your email and approve the video. Email us with questions. Entries accepted through July 1, 2012. 2012 World Choir Games still have volunteer opportunities! Apply TODAY!